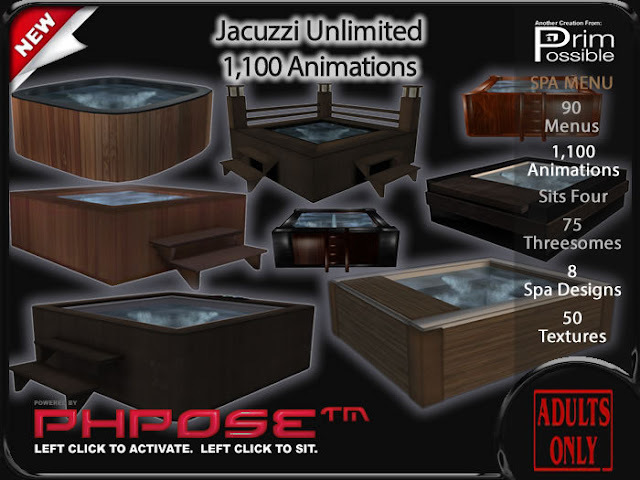 If you had bought selected items from Prim Possible, here is a good news, there are new upgrade 2016 versions of the furnitures and Kitty had just received her upgrade for the Adult version Jacuzzi which she bought some years back. Well, the poster above is for the old item, but rest assured the new one is being delivered in the Marketplace. Kitty has also quickly found a shape and color she love and this is the Crazy Pink Wood Plank version which should be most girl's favorite. And guess what? The 1100+ Animations is not longer valid! Oh yes, because its now 2000 Animations! Yes, wow, you can close your mouth now. Kitty always enjoys a bath in her tub and besides steam and bubbles, there are rose petals too. IT just helps take the fatigue of the day away. While you are admiring Kitty's huge pool, you might wonder how many people can share this tub. The answer is still 4, but lots more menu and options. And here comes the bubble. Just like the bubbles, which are free, but prim wise you might need 1 or 2 more but technically its optional, the upgrade of the Jacuzzi is... (drum rolls) FREE! Yes. Even for a customer like Kitty who had bought years ago and not as blogger for Prim Possible. Now, that is after sale services! You should be getting upgrade notices soon if you bought from the Marketplace and perhaps a little while more if you bought it in world.